Years ago we were sitting in Blake Edwards’s bungalow on the Culver Studios lot. When he walked in to begin a long interview, he remarked that he had just come from a session with his analyst, Milton Wexler, where they had discussed our books on his films. We lightheartedly asked whether, after a lifetime of psychoanalysis and our two books of critical analysis, he didn’t understand why he made the movies he did. After a pause, he thoughtfully responded, “No.” Indeed, he was so respectful of both critical perspectives that he asked us to interview Dr. Wexler for a biography we were planning on him and then he arranged for it. We have written this brief introduction to the reprints of two of our essays that are part of a special issue of Screening the Past honoring Blake Edwards for several reasons. “Detecting, Defecting, and Whistling in the Dark: The Recent Films of Blake Edwards” (1974) was not only the first article we wrote on Edwards but also the first piece we coauthored; we were both doctoral students at the time. It played a key role in securing a contract for our first book, Authorship and Narrative in the Cinema, and, along with a 1976 essay on Edwards’s Gunn, led to our first interview with Blake in 1979. That was the beginning of a long relationship that included an open invitation to visit any of his production sets, which we did repeatedly for a week at a time beginning with A Fine Mess (1986) and continuing through his 1995 Broadway musical, Victor/Victoria, and later Off-Broadway work. We have interviewed him numerous times in hotel rooms, offices, and his homes in Manhattan and Brentwood. We have also participated in various events honoring him, like the activities surrounding the prestigious Preston Sturges Award jointly granted him by the Writers and Directors Guilds of America and a tribute to and honorary doctorate awarded him at Arizona State University. “`Crazy world full of crazy contradictions’: Blake Edwards’ Victor/Victoria,” (1983) was written nearly 10 years after our first article. By then we had published our book, Blake Edwards (1981), which included a revised and expanded version of our 1974 essay. 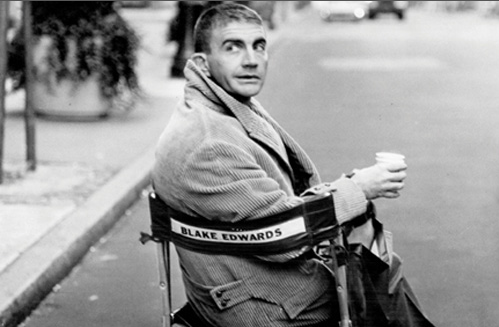 Similarly, in 1989, we published Returning to the Scene: Blake Edwards, Vol. 2, which included an entire chapter on Victor/Victoria, revising and expanding the 1983 essay. During this time we also began conducting extensive interviews with people who had worked with Blake at all stages of his career, some of whom have subsequently died. They include his wife and collaborator, Julie Andrews, his frequent composer Henry Mancini, producers, actors, set designers, and editors, among many others. The editors of Screening the Past generously offered us the opportunity to revise and update these articles but in a sense our books have already done that. But there is another context that returns us to our opening anecdote. We are now about the age Blake was when we started to regularly visit his sets to watch him work, visits integral to the biography we are currently writing. What we started as graduate students is still a work in progress. When we left the set of A Fine Mess after a week of observing him work, we said, “Goodbye, Mr. Edwards.” He responded in mock outrage, “After the book and all this, it’s still Mr. Edwards?” After that, it became “Blake” for us. During the years of our research and writing, we have changed, the field of film studies has changed, and our relationship with Blake changed. Those evolving contexts are reflected in these articles, which are frozen in the time in which they were written. Neither of them is definitive, nor are our books on Blake. As with analyses of any major artist, they can never be. His work is too rich and his personality too complex for the final word to ever be set in stone. Were someone to ask us a variant of the question we asked Blake years ago, whether we fully understand the meaning of his films as well as the reasons we continue to study them and the man who made them, we would respond, “No, but we have learned a lot.” Now that his life is complete, we have a new task before us: to finish the biography that includes our understanding of his work and the extensive research we have done upon it, and in the process recontextualizing it once again. The reprints here represent important moments in an ongoing process, which we hope will bring knowledge of lasting value even if it can never be truly complete and never bring a simple “yes” answer to the big question.